Some hunters prefer the challenge of hunting with a slingshot. Hunters typically use rifles, shotguns and bows to take down wild game, but using a slingshot offers benefits. 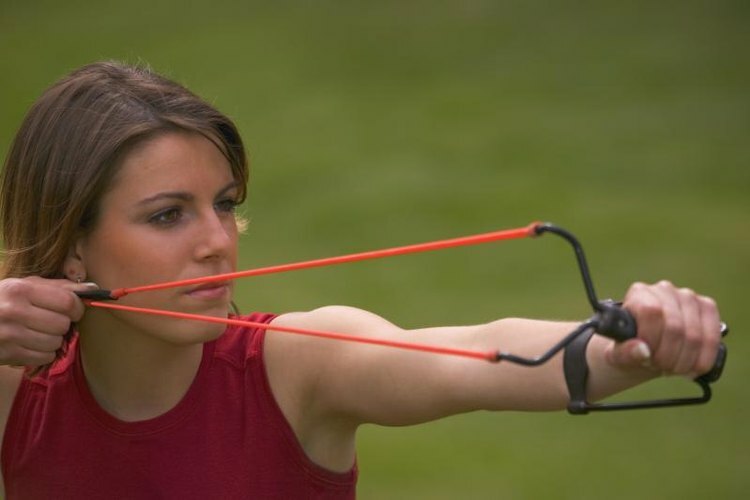 Slingshots are generally inexpensive, do not attract as much attention as a firearm and, in most instances, do not require a license to own or carry. Additionally, slingshots require minimal maintenance and are lightweight, which allows you to carry one in a pack for use in survival situations. However, you must be aware that slingshots work for only small game, such as squirrels, rabbits and birds. Also, slingshots are not toys and should be used with the same caution as other types of hunting weapons. Put on safety glasses to protect against the potential ricocheting of slingshot ammunition; anyone accompanying the hunter should do so as well. Hold the slingshot handle with your weaker arm and fully extend your arm. In terms of the grip, you have options. You may grip the handle of the slingshot as if you were holding a hammer. With this grip, the ends of the forks will be pointing toward the sky, and the tip of the handle will be pointed toward the ground. You also may hold the slingshot with your thumb and pointer finger in a V-shape. The thumb will rest against one fork, and the pointer finger will rest against the other fork. Your other fingers will hold the handle of the slingshot. You may hold the slingshot upright, with the forks aiming above, or with the forks pointing to the right or to the left. Keep the plane of the forks parallel to your body. Neither fork should be closer to you than the other one. Place the shot into the pouch located in the center of the band. Place it with your dominant hand. Next, grip the pouch with the same hand. Use your thumb and the side of your index finger to pinch the pouch directly on the spot where the shot is located. Make sure to keep the shot centered in the pouch. Next, pull back only to the point where the pouch is even with your cheek on your dominant side. If you shoot right-handed, this would be your right cheek and vice versa for a lefty. The band should stay parallel to the ground. Make sure you keep the forearm of your dominant arm in line with the sling. Do not tilt your elbow up or down. Your weaker arm also must stay parallel with the ground and cannot bend at the wrist or elbow. Your weaker arm should remain fully extended throughout the shot. Using good form during the shot will maximize your accuracy. Make sure to stay consistent with your form on each shot. Line up your shot by making sure that the target is in line with your dominant arm. Then take a breath, steady your upper body and release the shot. Through practice, you will learn to use instinct to determine where to fire the shot. Make sure you pull the band straight back. If you pull down too much, your resulting shot will sail too high. If you pull up too much, you will fire beneath your target. You also must be sure that you do not rotate the slingshot in your hand when you pull back. The forks of the device must stay parallel to your body. Purchase an extra band and carry it with you in case the one on your slingshot breaks. Only use your slingshot in an open area where there is nobody within the firing field. Never point a loaded slingshot at a person. They can maim or kill a human. Never allow a child to play unsupervised with a slingshot. You also never should use a slingshot while you are running or riding inside a vehicle or on a motorcycle. Always check the local, state and federal laws before hunting game with a slingshot.